Caroline Lucas, would-be Green MP for Brighton Pavilion, tells Brighton Journalist Work’s student George Walker that fashion isn’t important in politics – but shopping ethically is… read more here. 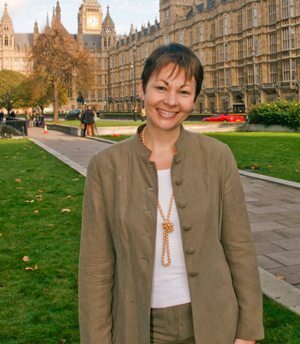 Caroline Lucas has had a highly successful political career, not just as the leader of the Green Party, but also as a champion for charities and organisations promoting ethical campaigns. Politics has never been the most glamorous of professions, but Caroline has stood out in the political style stakes, showing politicians that green living can easily fit in to the lives of young professional families. George Walker speaks to Caroline Lucas about her hopes for a more ethical fashion industry, her natural beauty secrets and how she strives to live an ethical and stylish life. George Walker: How important is fashion in your line of work? What ethical labels do you love? Caroline Lucas: Fashion isn’t really important in politics, although people will always focus on your appearance when you’re in the public eye. So I guess I like to look stylish, but am in no way a label-junkie! I like independent shops and brands which achieve high ethical standards and keep prices reasonable for the shopper. The Gossypium boutique in The Lanes [Brighton], for example, is a striving independent enterprise employing local people and promoting strong green credentials at affordable prices. It even sells make-it-yourself kits using fair trade materials. The Brighton based Ecochicollection online shop is great for ethically made jewellery across all budgets. I also like People Tree, which manages to be both extremely stylish and very ethical. Vintage shops are good places to find chic secondhand clothes, and importantly, high street stores like M&S and Topshop have now started to sell increasing numbers of Fairtrade cotton pieces.